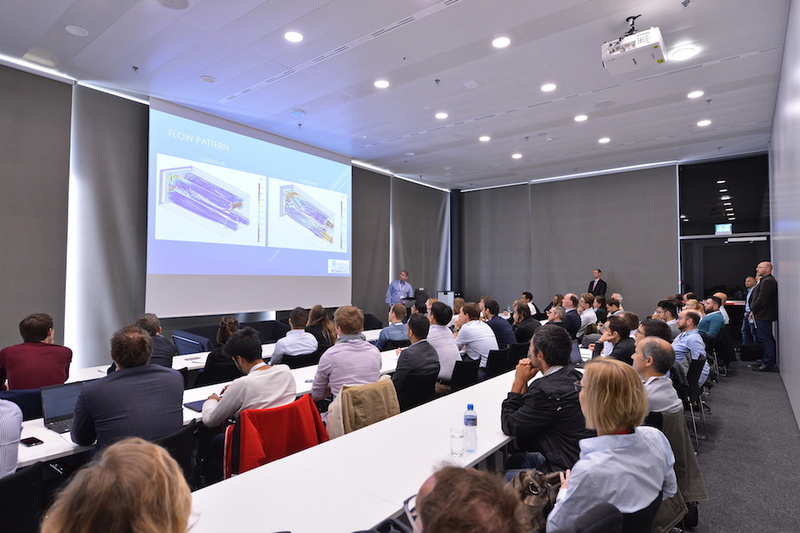 Nearly 400 academic and industrial engineers and researchers from 38 countries joined us last week for the annual COMSOL Conference in Lausanne. 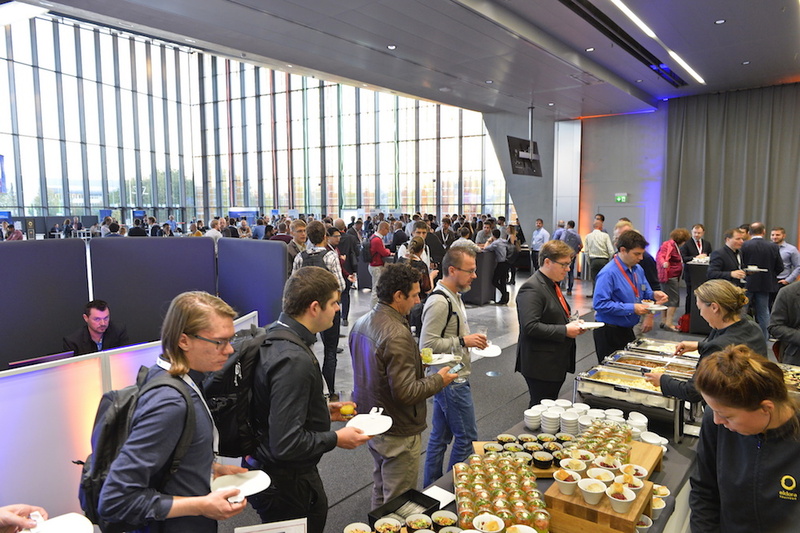 Mild fall weather accompanied us for all three days of the event, letting the sun shine through the impressive Graetzel cell windows of the SwissTech Convention Center. 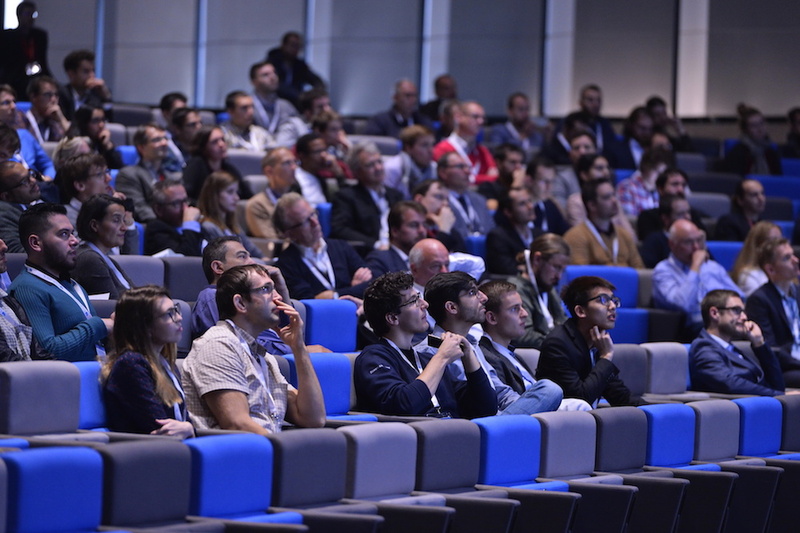 Read about the highlights of the conference and browse the photo album below. 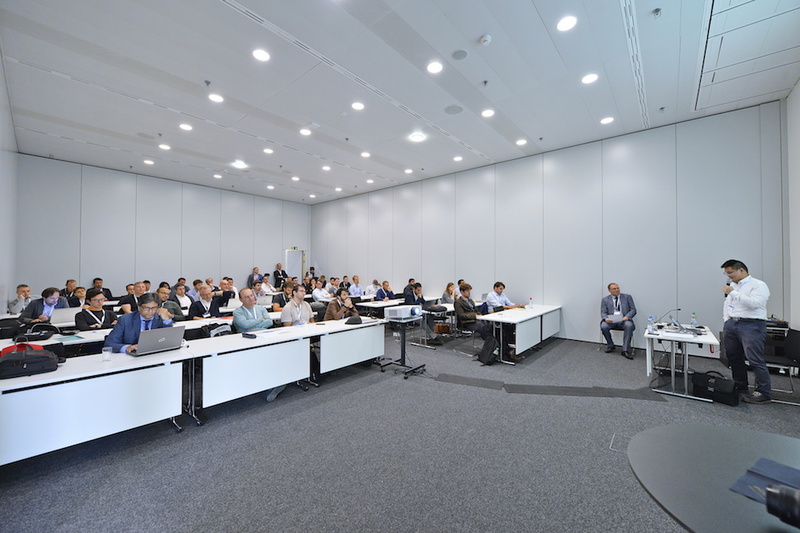 The original Swiss cowbell welcomed COMSOL Conference 2018 Lausanne attendees shortly before the first block of minicourses on Monday morning and, throughout the conference, served as a traditional way to announce the start of the next session. 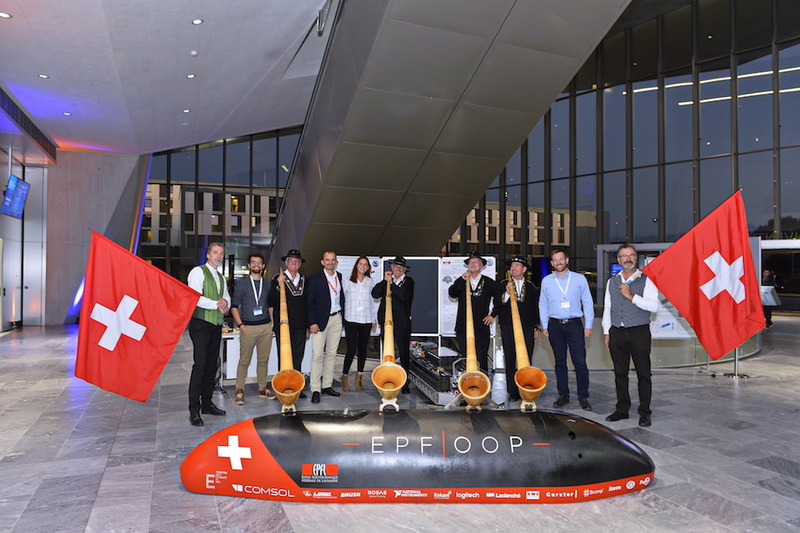 A Swiss cheese and wine degustation icebreaker reception, accompanied by the music of Alphorn Academy of Switzerland, added another bit of traditional flavor to the highly technical conference program. 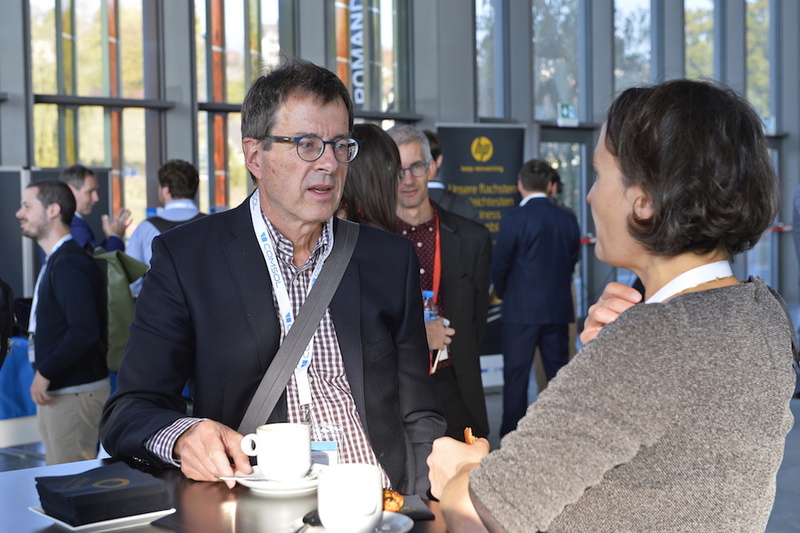 Conference attendees enjoy coffee and conversation in between sessions. 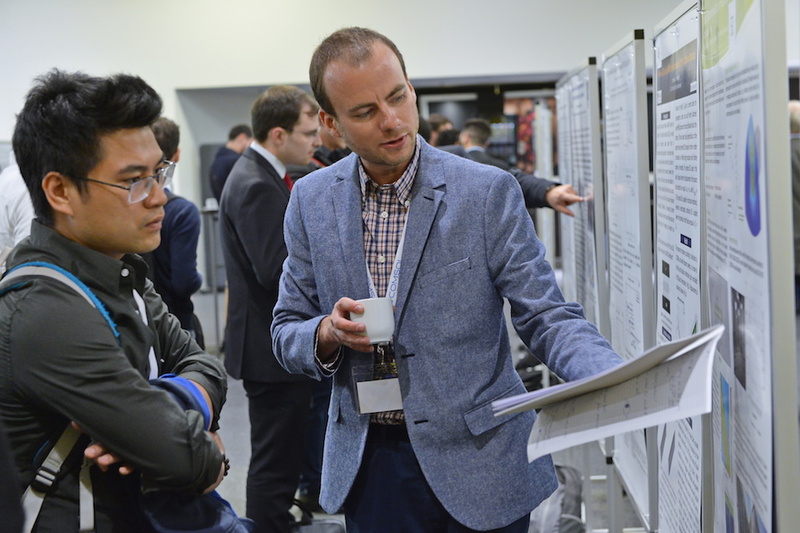 Over the course of the three-day event, engineers, researchers, professors, and undergraduate students shared their simulation experiences at nearly 30 user presentation sessions. Attendees were also able to choose from 46 technical minicourses covering all areas of physics. 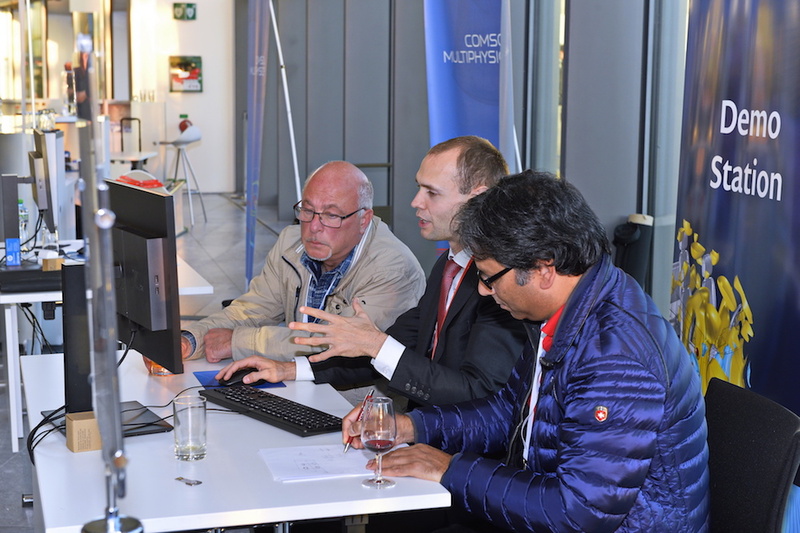 In addition, demo stations were available for questions in all disciplines, including for the newly released products and updated features. 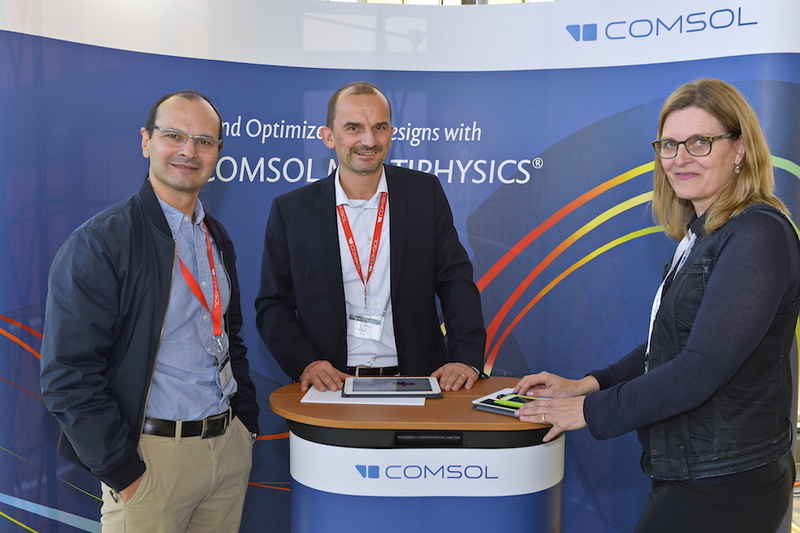 If you missed the COMSOL Conference this year, check out the photo gallery below, as seeing the experience for yourself is far better than reading about it. For those of you who attended the conference, browse the slideshow and try to spot yourself in a photo! 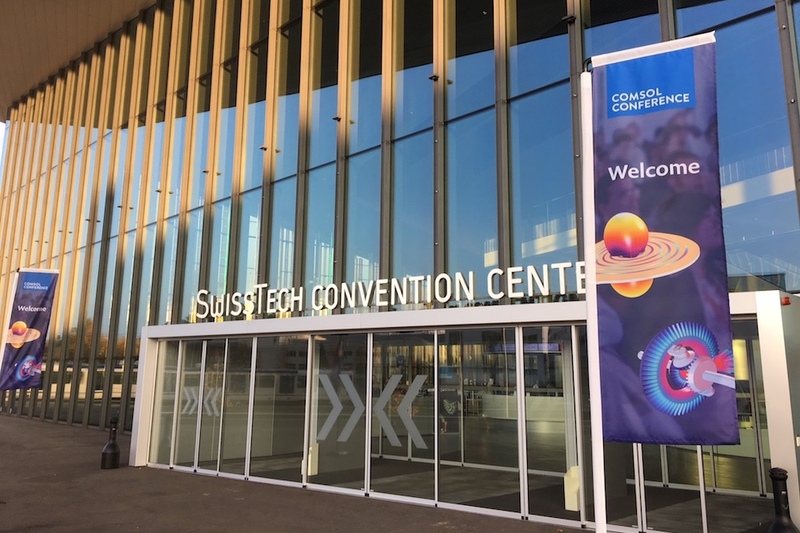 The conference was held at the SwissTech Convention Center in Lausanne. Attendees can discuss their modeling questions at the demo stations throughout the conference. A group photo with the EPFLoop team from the nearby Swiss Federal Institute of Technology. Melissa Assad-Bustillos from INRA, France, presents her work in structural mechanics simulation. Academia meets industry: Benedikt Weber, EMPA, Switzerland, and Sigrid Andreae, Hilti AG, Liechtenstein. 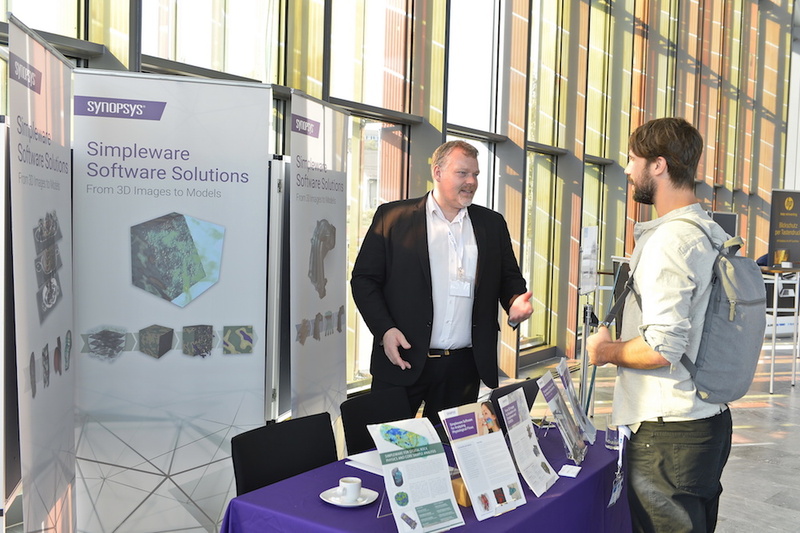 Synopsys was a Gold sponsor of the event. Jialong Shen from University of Warwick, U.K., presents on his use of the AC/DC Module. 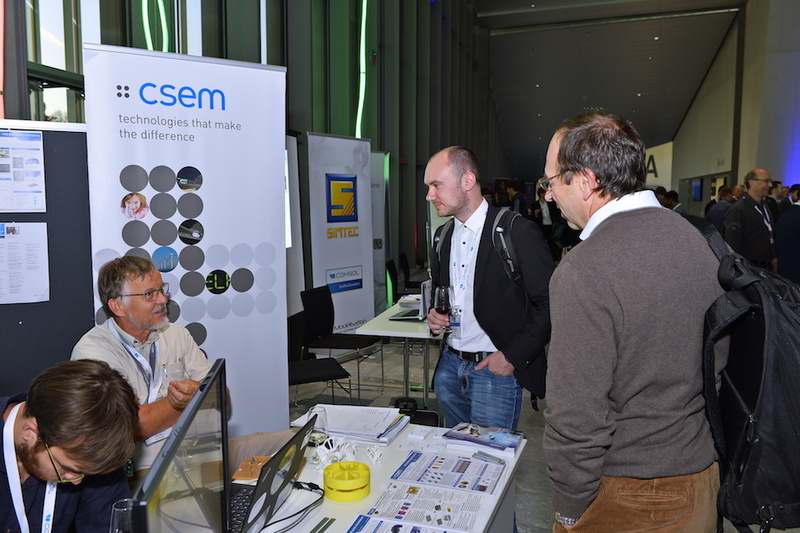 CSEM was a Gold sponsor of the event. 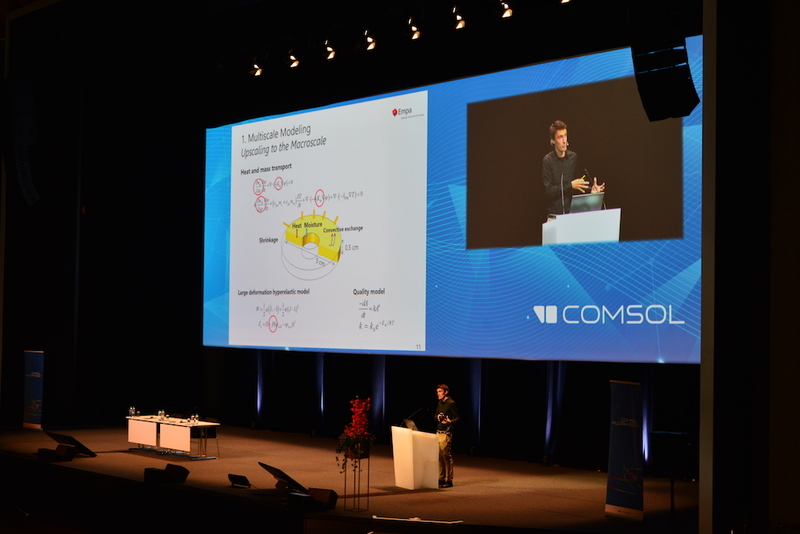 Thijs Defraeye discusses how EMPA, Switzerland, uses modeling to optimize convective dehydration processes. 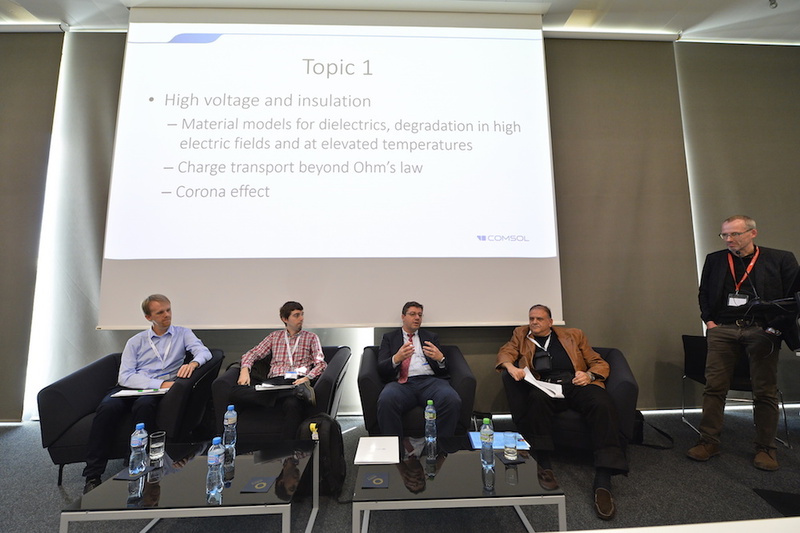 Panelists moderated by Prof. Jasmin Smajic of University of Applied Sciences in Rapperswil and Magnus Olsson of COMSOL discuss hot topics and current trends. A delicious assortment at the Gala dinner. 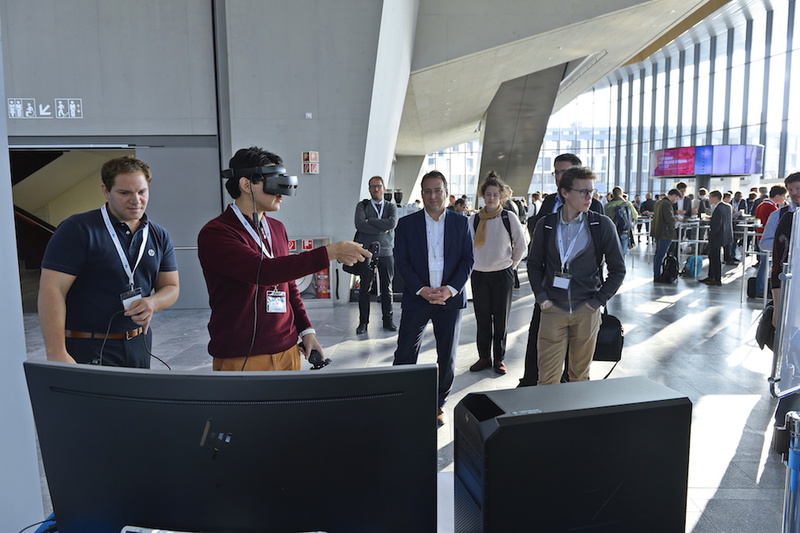 Attendees experience virtual reality at the exhibitor booth of Gold sponsor HP Switzerland. 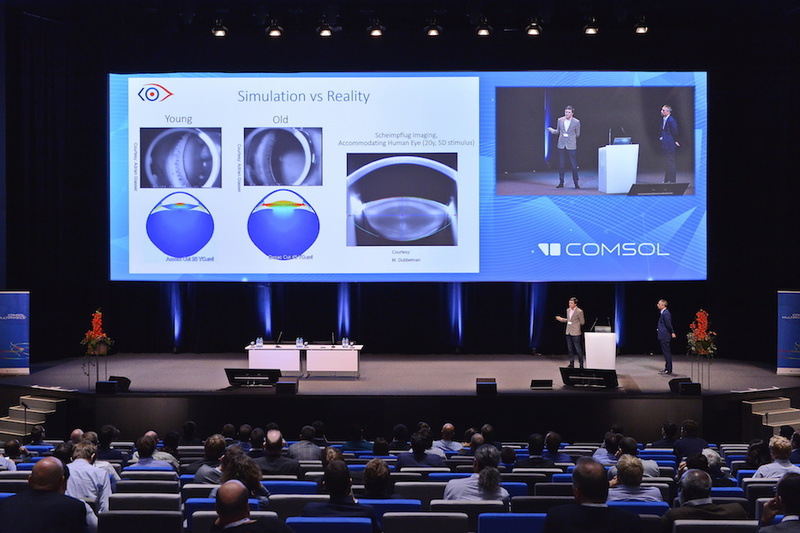 David Enfrun and Aurelien Maurer demonstrate how multiphysics simulation contributes to their development of personalized eyesight solutions. Peter Christensen from Virtual Water Technology, Denmark, shares his simulation results during his presentation. 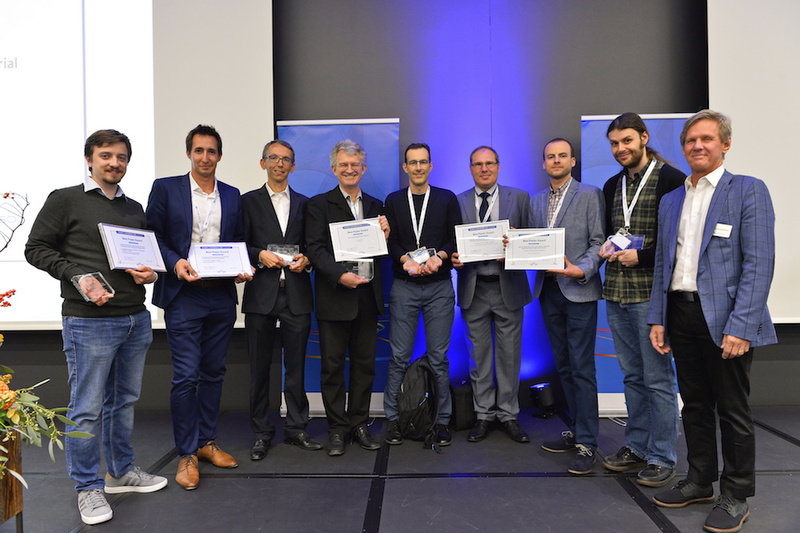 The winners of COMSOL Conference 2018 Lausanne Best Paper and Best Poster awards. 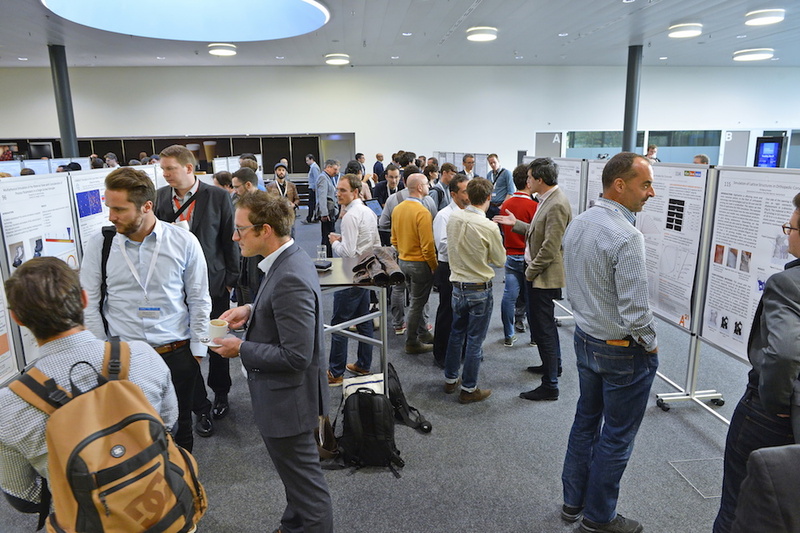 We’d like to thank everyone who attended and presented at the COMSOL Conference 2018 Lausanne; the Program Committee members who reviewed and evaluated more than 200 abstracts; and our Gold sponsors — CSEM, Synopsys, and HP Switzerland.